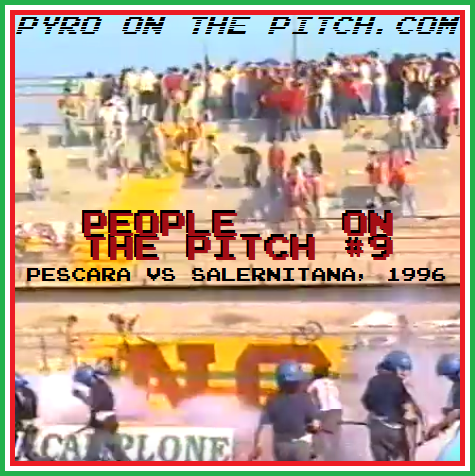 We took our first look at Italy’s rich domestic fan scene back in People On The Pitch #9, with Salerntiana’s invasion of Pescara and their pitch. 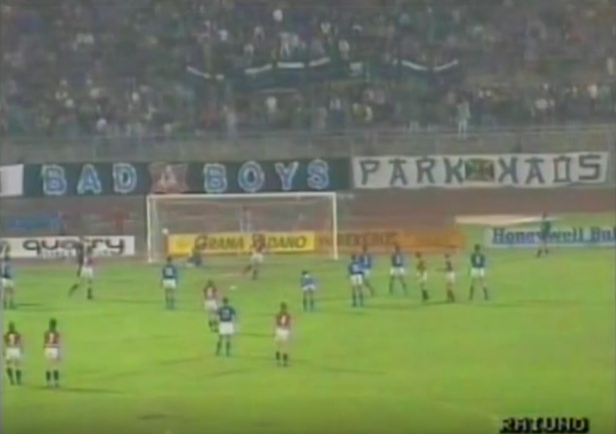 Check out that article for our original introduction to Italian ultras but we are certainly not stopping there, as we now once again head to Serie B in the 1990s. 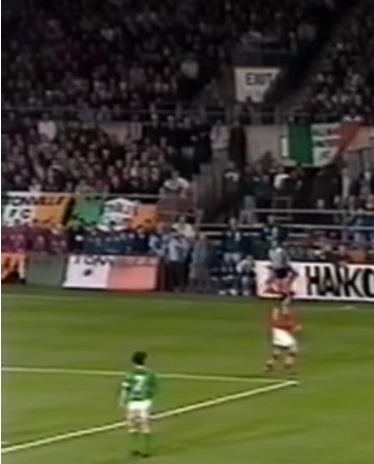 The idea of two clubs merging together is one that most supporters instantly balk at, and understandably so. 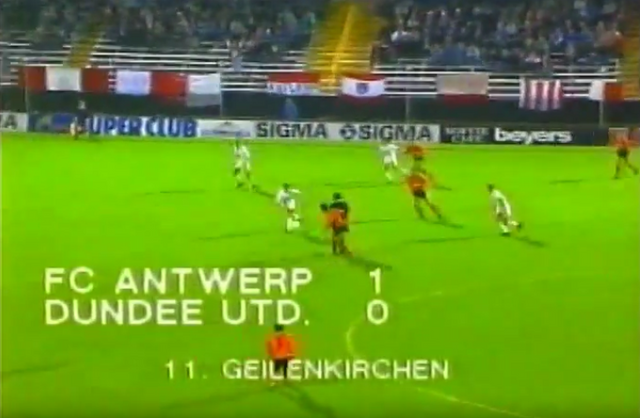 Most modern mergers involve smaller clubs, but some examples of famous teams who exist as the result of mergers include Ipswich Town (1888) and Newcastle United (1892) in England; FC Twente (1965) and FC Utrecht (1970) in the Netherlands; Hamburger SV (1919) and 1.FC Köln (1948) in Germany; and Fiorentina (1926), AS Roma (1927) and Sampdoria (1946) in Italy. All of the above became huge staples of the community, and any opposition to a union with a local rival at the time of the merger has been long forgotten. Of course these were of a different era, with the proposed merger of Sampdoria with enemies Genoa in 2001 being an example of a modern mash-up that was never going to fly. Many other Italian clubs have complicated histories of name changes and mergers, one of which being Venezia FC from the city of Venice, founded as Venezia Foot Ball Club in 1907 after the union of Palestra Marziale (Martial Gym) with Costantino Reyer. Over the years they would also be known as Association Calcio Venezia, Società Sportiva Serenissima, Associazione Fascista Calcio Venezia, Calcio Venezia, Calcio VeneziaMestre, Associazione Calcio Venezia 1907, Società Sportiva Calcio Venezia, Foot Ball Club Unione Venezia, and Venezia Football Club Società Sportiva Dilettantistica before finally simplifying back to Venezia FC in 2015. The main merger in question with regards Venezia occurred in 1987, as club chairman Maurizio Zamparini took over as owner of financially weak neighbours Mestre, also of Serie C2 at the time. The clubs were fused together and became Calcio VeneziaMestre, moving to Mestre’s Stadio Francesco Baracca and adding orange to Venrzia’s traditional black and green strip. Naturally none of this went down well with many supporters in Venice, particularly the team being moved out of town. In response, Calcio Venezia – a new amateur team claiming the true spirit of the club and wearing the traditional black and green strip – was formed and entered the lower leagues at the start of the 90s. 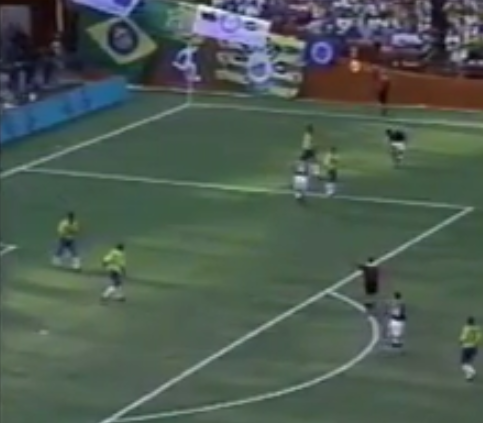 But there was those who were not opposed to the changes and accepted it as part of football. 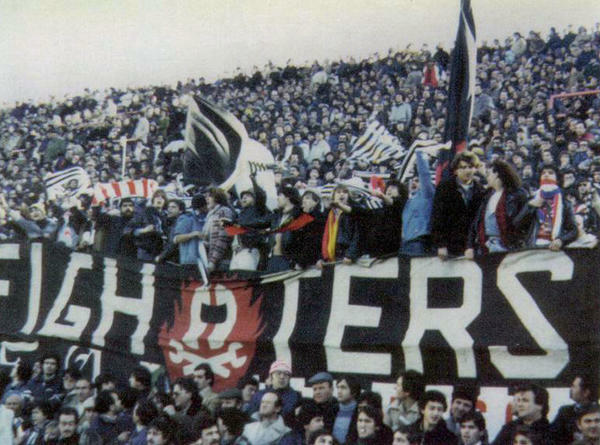 While old ultras groups at the club such as Panthers, Brigate Neroverdi (Black-Green Brigades) and Gioventu’ Neroverde (Black-Green Youth) had already dissolved pre-merger, Vecchia Guardia (Old Guard) of 1986 continued to offer support into the new era and were joined by a large new group who’s name reflected the reality: Ultras Unione VeneziaMestre. 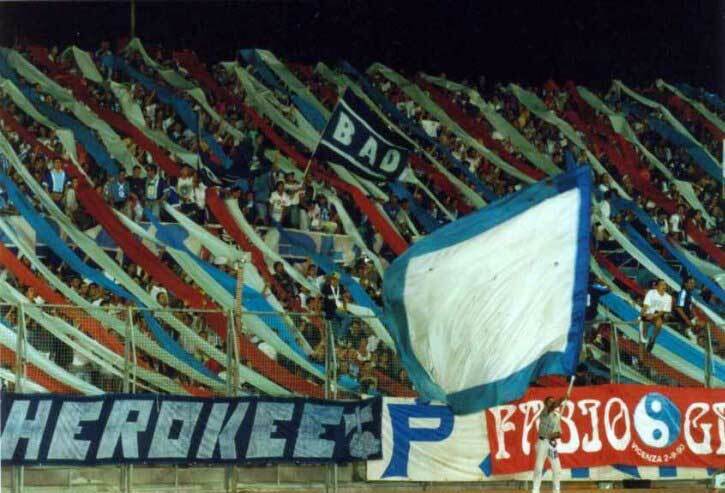 Banners of groups such as Front, Kaos, and Ultras Unione, Venezia vs Casale, 90/91. 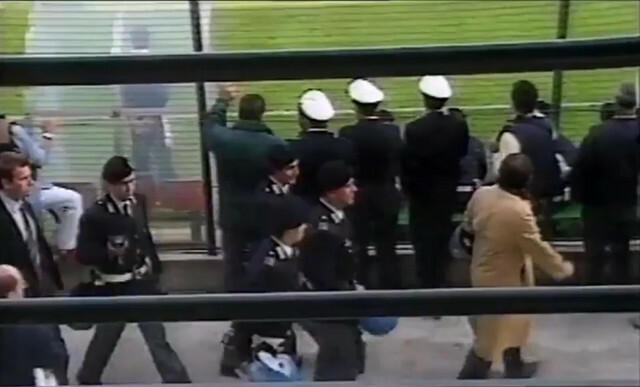 The name VeneziaMestre only officially existed for two seasons and the club moved back to the Stadio Pierluigi Penzo in Venice upon their promotion to Serie B in 1991 (a result of the combination of talent from both former teams), the popularity of which saw the collapse of the amateur Calcio Venezia side. 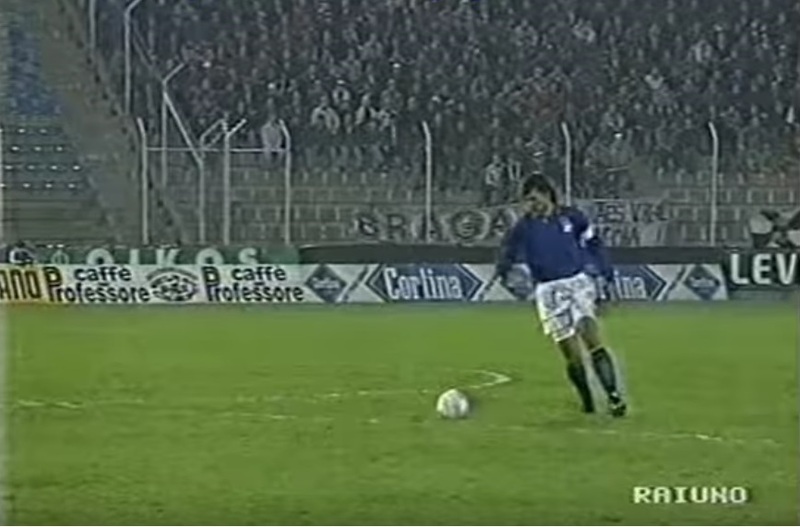 The change of ground also gave rise to new legacy sides in Mestre, who were now without a team. 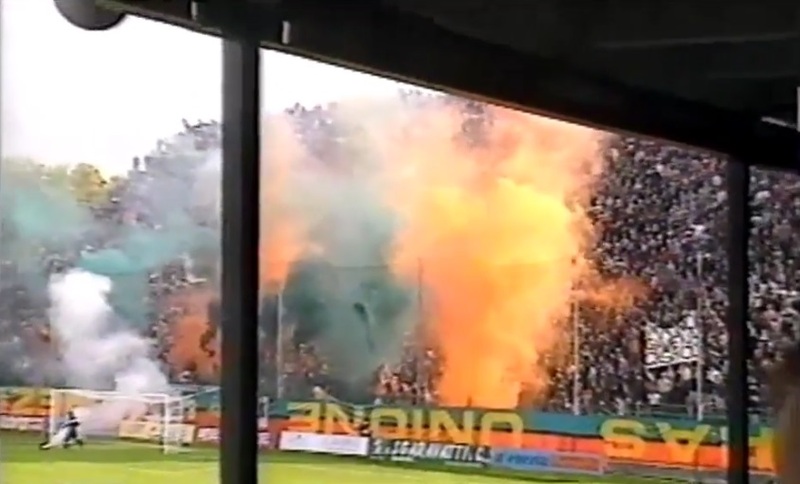 The memory of the merger was still maintained through the kits (the neroverdi now the arancioneroverdi) and through the terraces, as the huge Ultras Unione VeneziaMestre banner hung for many more years. 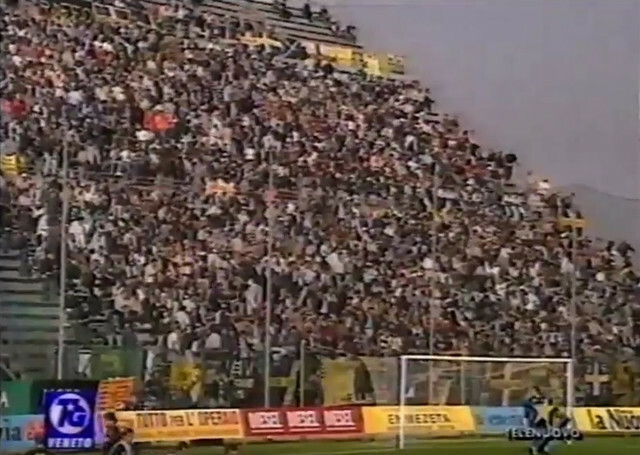 The progress that had seen the club rise from Serie C2, to Serie C1 to Serie B continued, and hopes were high as the 97/98 season started that this would be the year top flight football would return to Venice for the first time since the 1940s. 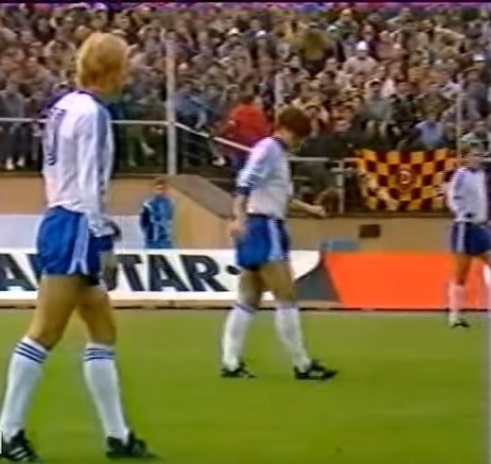 Another side in Serie B that season with an eye on promotion were recently relegated Hellas Verona, who had been unexpected Serie A champions in 1985. 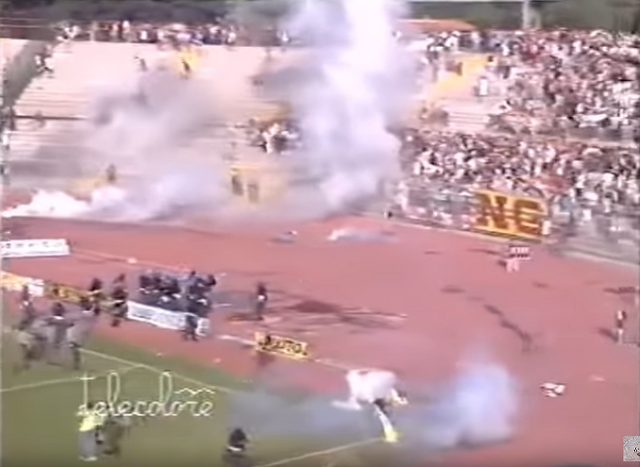 Financial collapse soon after brought demotion and the folding of the club, reborn simply as Verona in 1991 before becoming Hellas Verona once more in 1995. 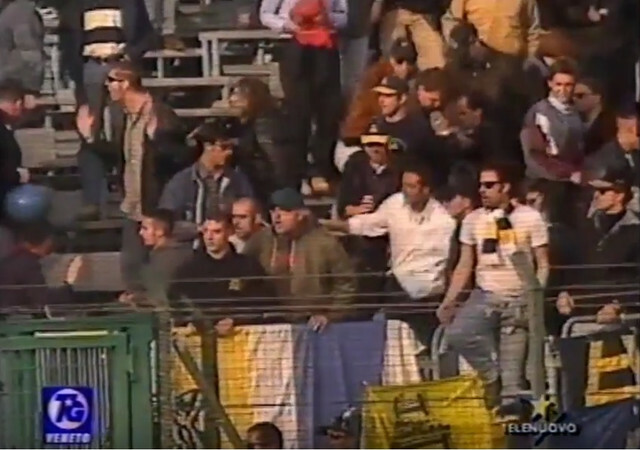 Verona of course possess one of the top followings in the country with dozens of ultra groups throughout the years, spearheaded by the historic Brigate Gialloblu’ (Yellow Brigades) to which many sub-groups claim allegiance. 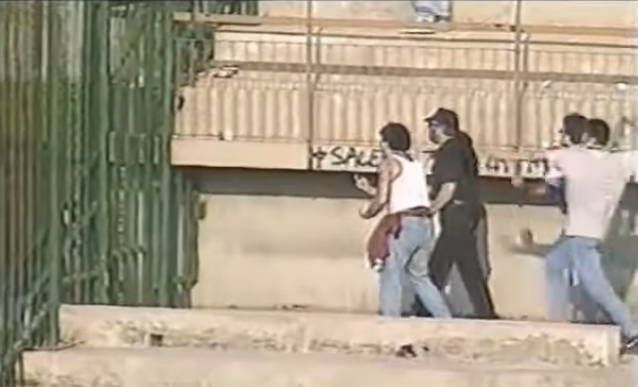 Despite the name being originally drawn from left-wing influences (based on the terrorist Brigate Rosse group, founded in 1970), the Verona curva became known as mostly right-wing by the 1980s, although the peaceful co-existence of left-wing groups such as Rude Boys prove that love of the club trumps politics. 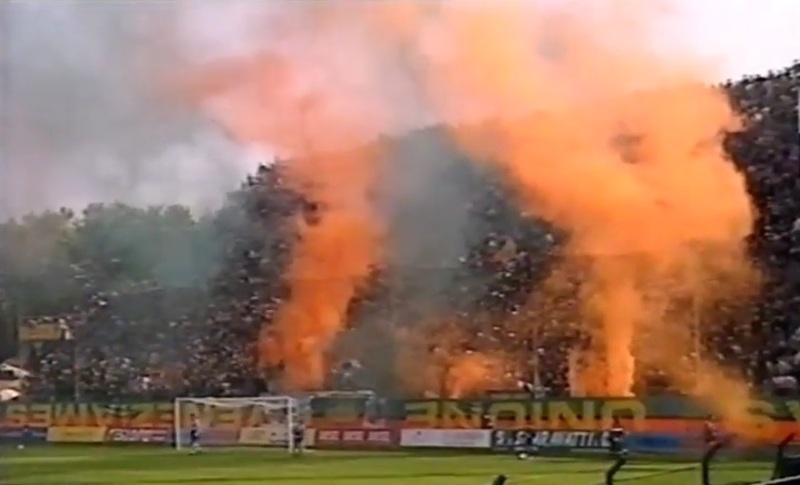 Hellas Verona supporters following a goal during a home match against Udinese, 90/91. 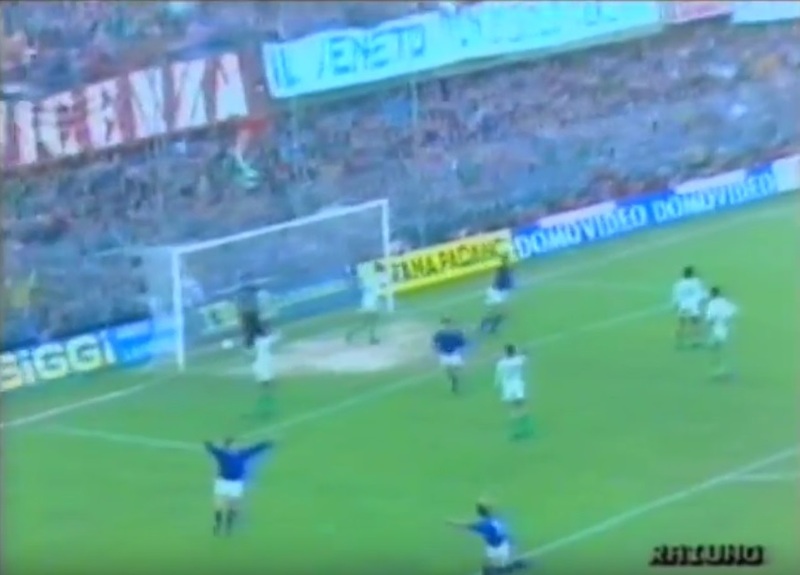 Demonstrating a common expression of displeasure, the Venezia ultras banners are placed upside down, probably in lament of some sort of disagreement with the club. 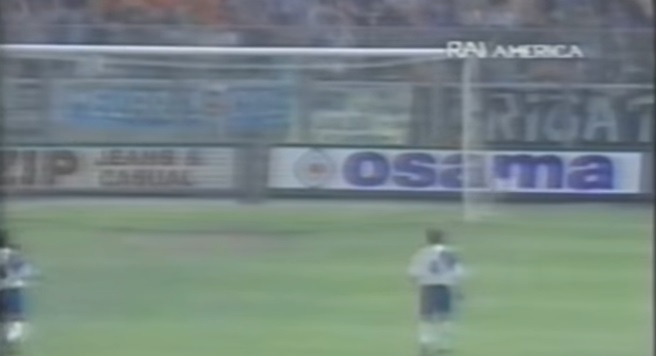 From this shot we can also see the “VeneziaMestre” portion of the Ultras Unione banner. 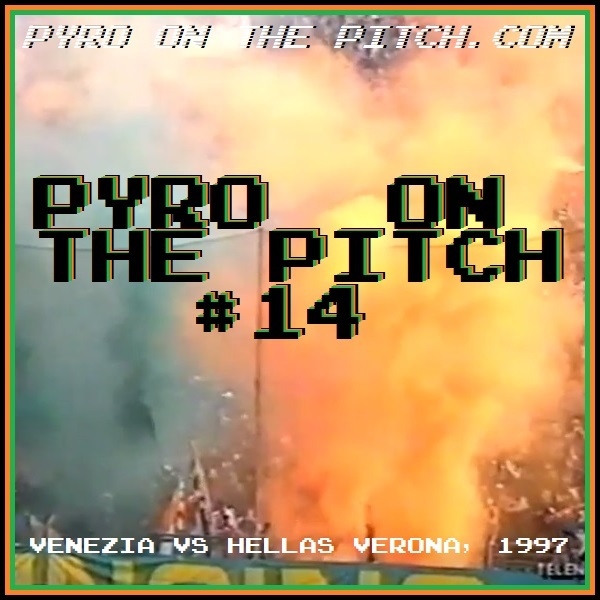 The scoreline would be repeated when the sides met again in March 1998 with both results being crucial in Venezia’s ultimate 2nd placed finish and promotion to Serie A, while Verona would have to wait another year. The dream of Zamparini had been realised, but whether the merger from 11 years before was a success for the city or remained a soulless selling out of the Venezia’s football tradition, is up to you. Welcome back to another edition of People On The Pitch, the series in which the “People” in question should not technically be on said pitch (as opposed to the players and match officials). 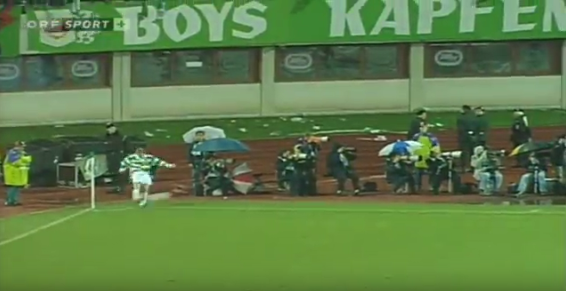 As we have seen already, there can be several reasons for this such as spontaneous outbursts of celebration, supporter demolition jobs, and pure drunken mischief. But we have also seen episodes of pure violence and this is once again another one of those times, so send the children to bed right now. 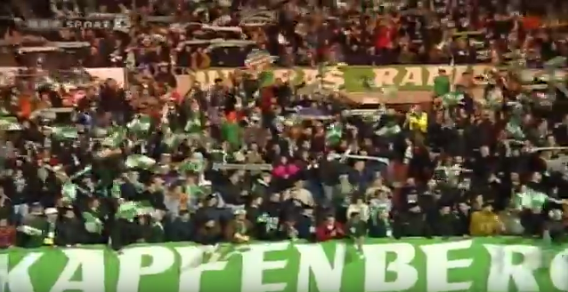 In Europe, certain fanatical supporter groups such as “Torcida” of Hajduk Split (established in 1950), “Gate 13” of Panathinaikos (1966), and many in England, are often rightly cited as pioneers of the universal fan scene that has evolved to the present day. But surely few would disagree that the location of the true historical crown is Italy – home of the ultras and arguably the most influential of all of nations in the supporter culture world. 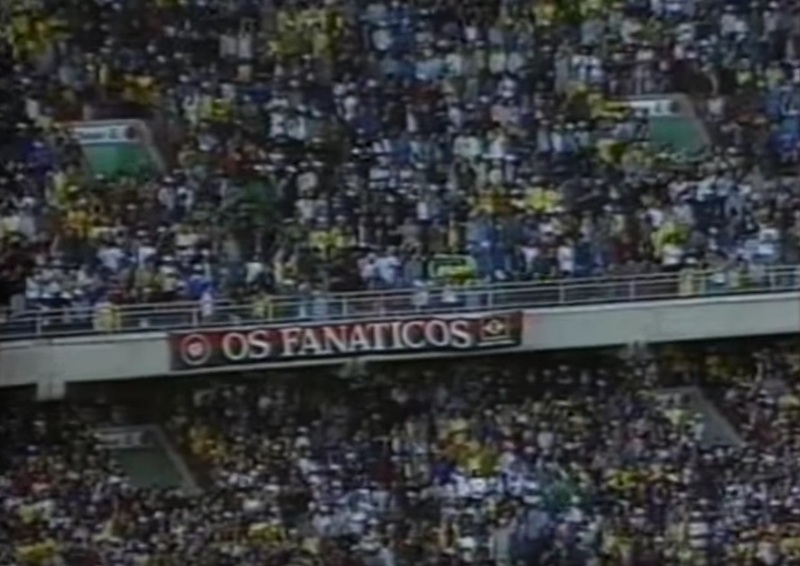 While “Torcida” was formed in Split by inspired Yugoslavian sailors who had been on hand to witness the colourful home support of the 1950 Brazilian World Cup (“torcida” being Portuguese for “crowd”), the Italians weren’t far behind as their own domestic breed of group reportedly began to spring up from 1951, with Tornio’s “Fedelissimi Granata” (Faithful Maroons) leading the way. In 1968 came Milan’s “Fossa Die Leoni” (Lions Den), considered to be the first true ultras group. 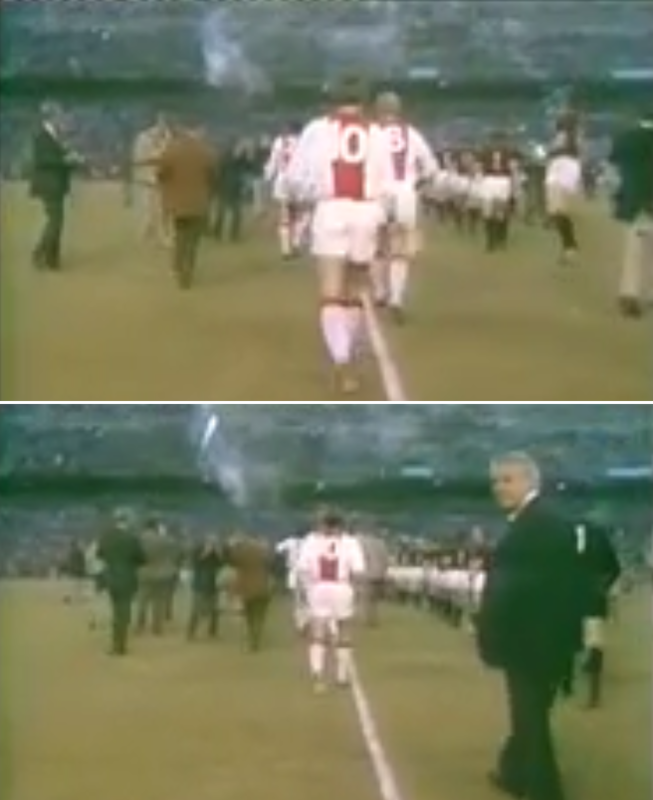 Demonstatrion of early "ultra action" - pyro comes from the crowd as AC Milan and Ajax Amsteram emerge for the 1969 European Cup final, Santiago Bernabéu Madrid, 28/05/69. 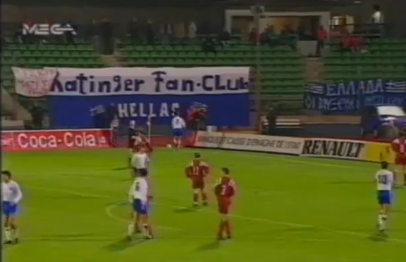 The term “Ultras” itself (from the Latin for “beyond”) was originally used by some groups as a stand alone name. 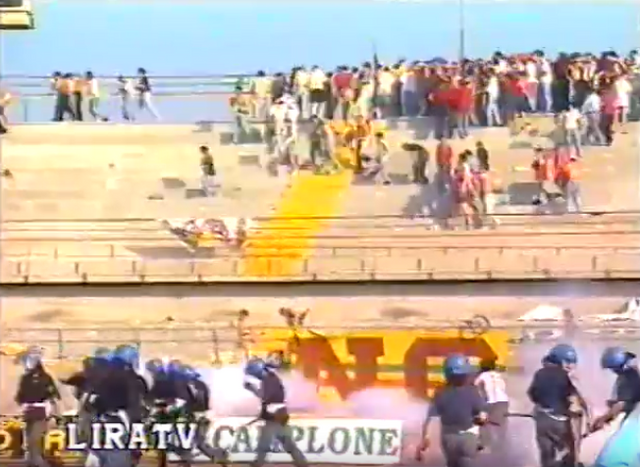 But the phrase was so apt that it soon came to be synonymous with these ultra-passionate tifosi (fans) units as a whole, with an explosion of activity particularly from the 1970s onwards. Partly inspired by the flourishing English fan scene (much more colourful at the time than it would later be), but very much born of a uniquely a continental zest, most clubs across Italy soon had their own ultras groups; each with their own name (many deriving from a set selection of motifs), stadium sector, group banner, and often a political affiliation. 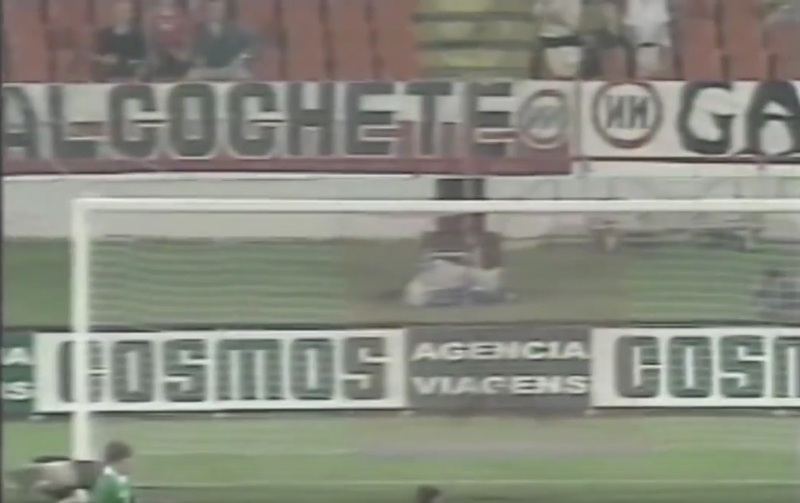 Large flags, immense creative banners, chaotic pyro and tremendous noise were characteristics on the “curva” behind the goal, where the groups were mostly to be found, but an equally important element was that of violence. 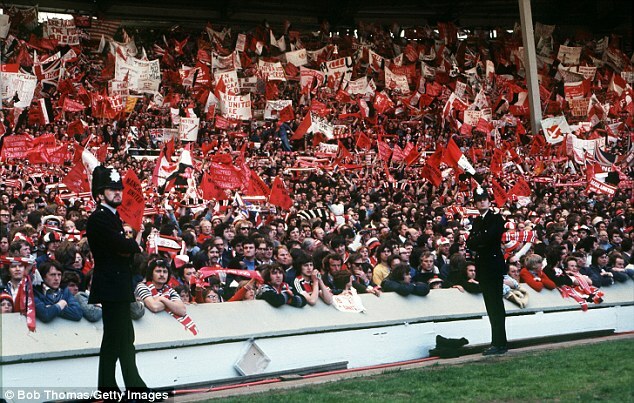 With provocative new regiments from rival cities now entering your turf as away fans on a regular basis, it was natural that like minded supporters organised to defend their town, stadium and the club’s “regular” support, as well as to urge on the team during the game. The post-apocalyptic atmosphere was reflected in some regularly incorporated group names that evoked images of New York city street gangs, such as “Commandos“, “Fighters“, “Brigate“, “Militia“, “Vigilantes“, and “Rangers” (as well as the straight up “Hooligans” moniker”). 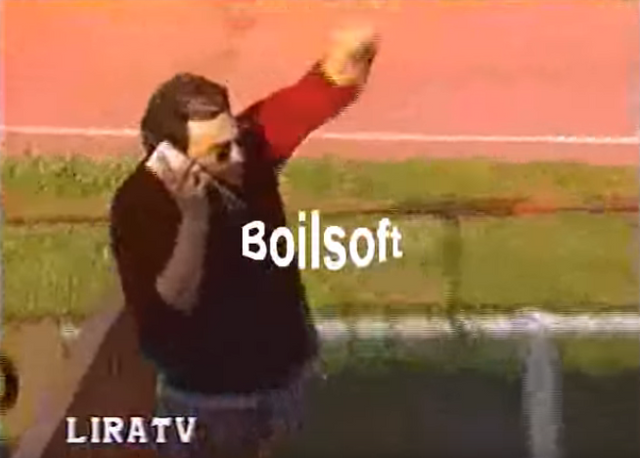 Scenes from the Italian ultra scene, circa 1980. As in England, a general sense of meaningless in the post World War 2 decades had left a generation disillusioned with a society that was hollow to them. 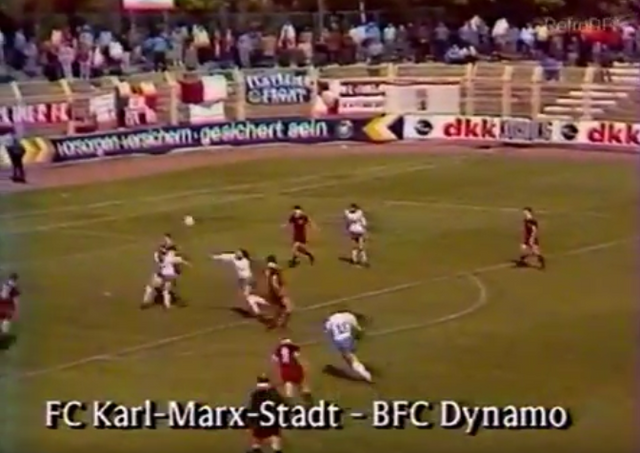 But the football club and the group was something real and tangible; a social microcosm to be defended with pride and an important local symbol, as well as being a platform to promote the extreme political leanings of many supporter pools. 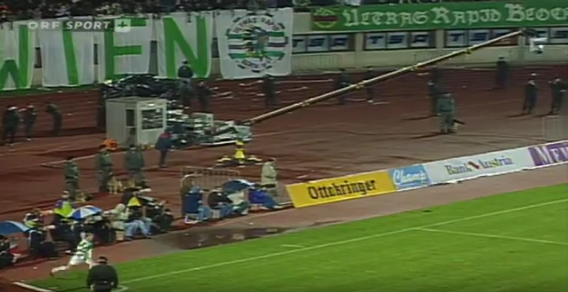 By the 1990s, club success in Europe and increased domestic footage through lucrative international television deals meant that Italian football and it’s fan scene were exposed to new audiences, many of whom marveled at the amazing atmospheres and tifo displays. 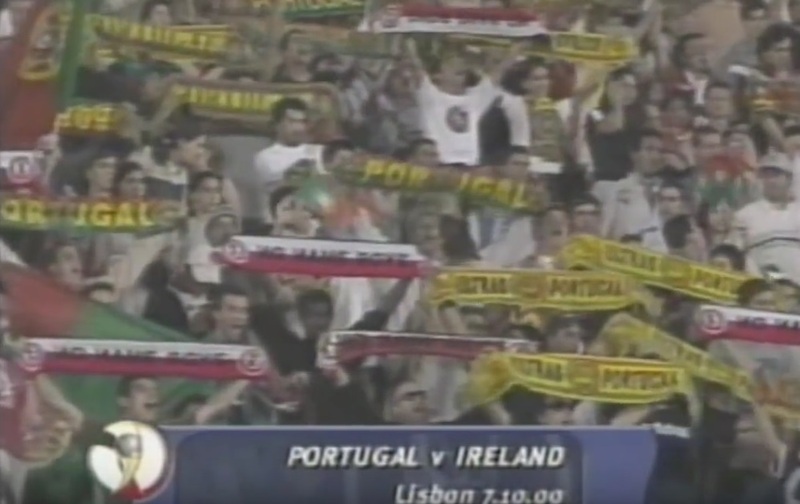 Again as in England, big clubs like Juventus, Milan, Inter, and other premier teams of the 90s greedily increased their global fan bases as they began to evolve from football clubs into corporate brands. 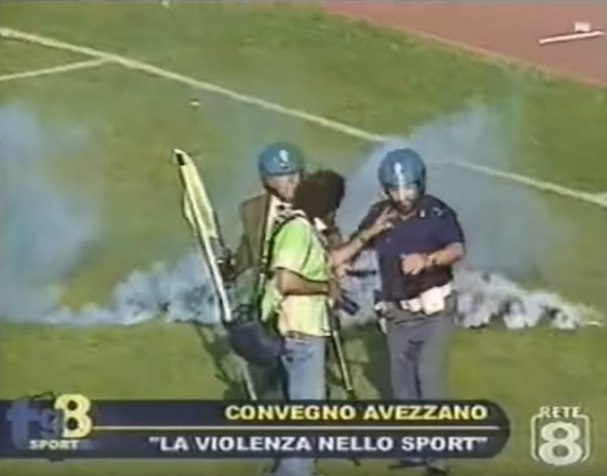 But away from the eyes of the world, lower league match-goers continued to support their less glamorous sides with just as much passion as those in Serie A, along with equally passionate clashes against rivals and the police. 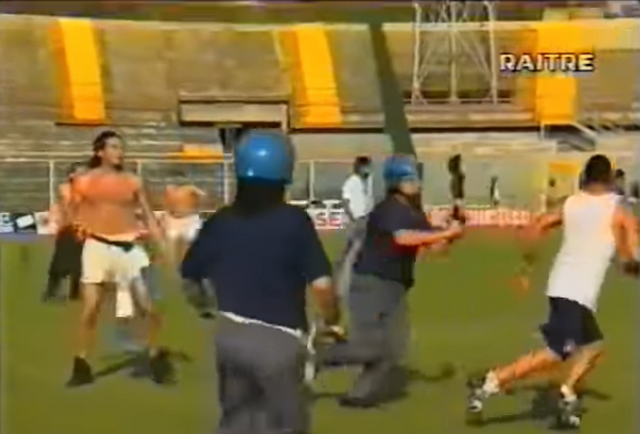 Thusly, for our featured incident it is to the Serie B of 1996 that we now turn, with a tie between two clubs that have only spent a combined 8 years in the top flight of Italian football at the time of writing: Pescara and Salernitana. 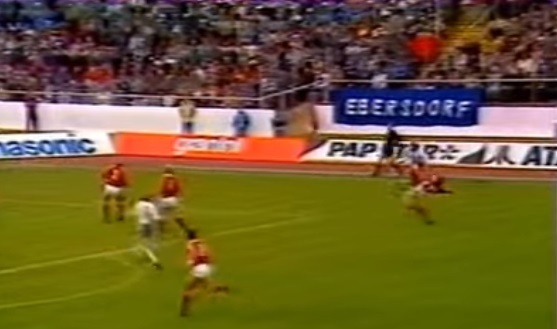 Pescara are a club we have come across before on the site through International Duty #1, with some groups’ banners present for an Italy vs Norway friendly hosted in their Stadio Adriatico in 1988 (a common theme for Italian clubs with the national team’s brilliant rotation of home staiums). 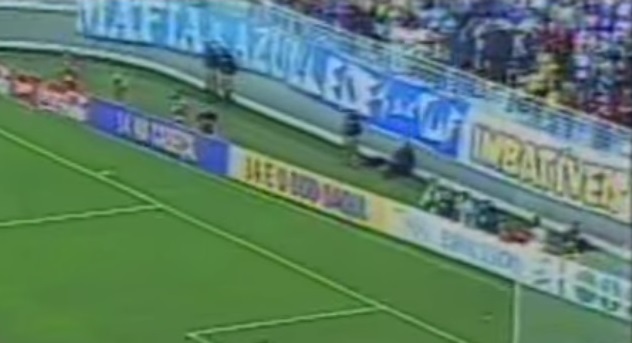 While many sides’ fans would generally swing one way or the other with regards politics, Pescara present an interesting (but not unique) example to the contrary using the two groups on show at this match: “Park Kaos” display a Jamaica/Bob Marley flag in the middle of their group banner signifying a left-wing leaning (with Jim Morrison on one version), but this regularly sits happily beside the “Bad Boys”‘ equivalent that featured a US Confederate flag (with overlayed Confederate solider parelling Marley), indicating the opposite alignment. 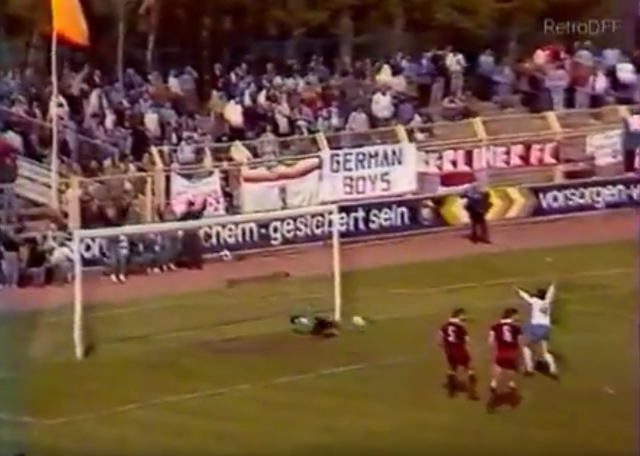 Pescara group banners at Italy vs Norway, friendly, 19/10/1988. 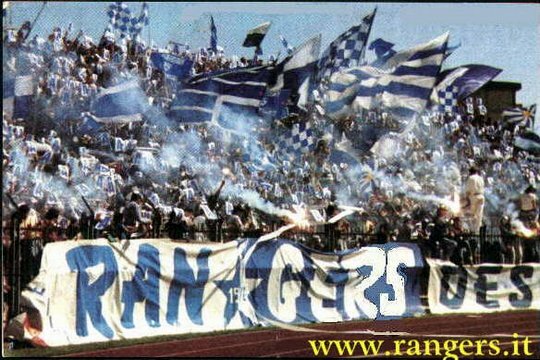 Of the other Pescara groups, among the most prominent were “Rangers”, “Bronx” and “Cherokee” (with the banner of Vicenza’s “Fabio Group” also often present, due to a strong friendship between fans of the two clubs). 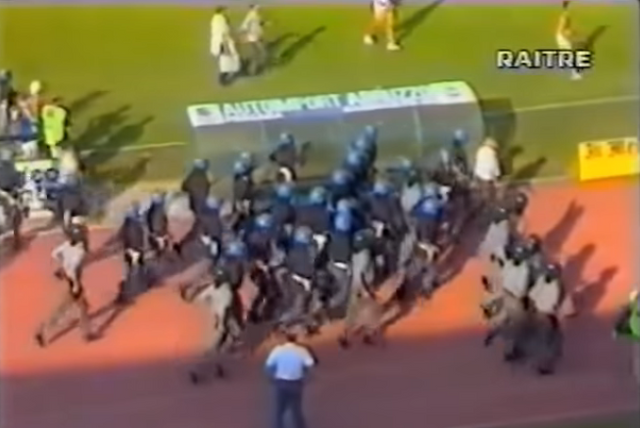 While Some members of these groups were no doubt involved in the incidents that were to come on the last day of the 95/96 season (with nothing to play for for solidly mid-table Pescara), it was the promotion pushing visitors from Salerno who would take the main focus. 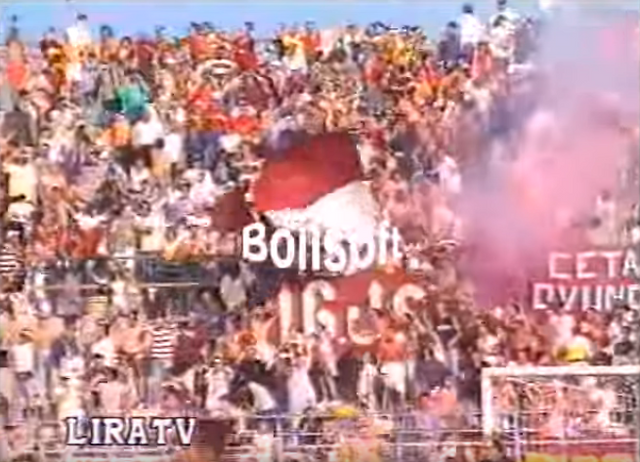 Salernitana, another maroon/granata wearing team of a mostly right-wing persuasion, were very well represented on the terraces of their 30,000+ capacity home Stadio Arechi. 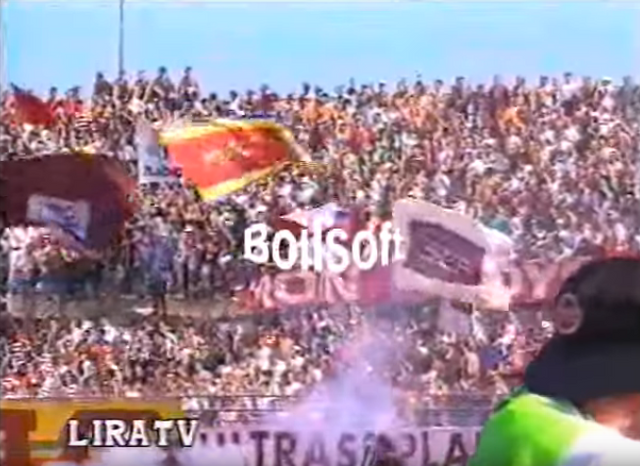 Throughout the years, this included the groups “South Force”, “Ultras Plaitano”, “Salerntiana Bersagliera” (Sharpshooters), “East Side”, “Fighters”, “Dragano Granata”, “Panthers”, “Wild Group”, “Nuova Guardia”, “Nucleo Storico”, “Point Break” “Iron Boys”, “Scon Volts” (sconvolti directly translating to upset, but Italian slang for “Stoners”), and “Ultras Ghetto”. 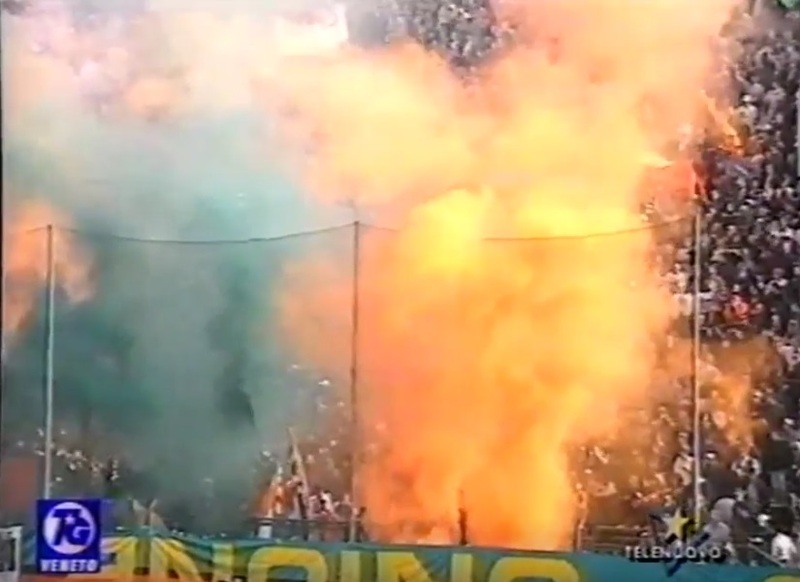 Salernitana's home curva in all it's glory, circa 1988. 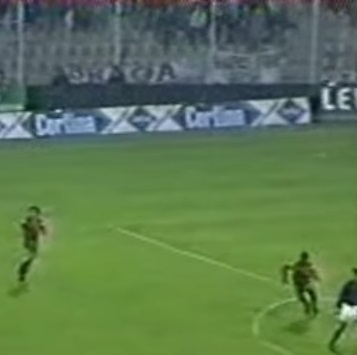 Going into the final series of games in 95/96, the team needed a win away to Pescara in order to be in with a chance of securing the last promotion place of the top four still up for grabs – and in doing so make it to Serie A for the first time since their one and only appearance up to that point back in 47/48. But going up would be still out of their hands, as they had to hope that Perugia didn’t get more than a draw at home to Verona at the same time. The sentiment may seem grandiose to those football fans who lazily support bigger clubs on television, which often also brings a tendency to look down on underachieving sides like Salernitana. But the great days and sense of community that the club had given the Salerno tifosi over the years had clearly instilled something in them that will forever be lost to many unknowing bar-stoolers. 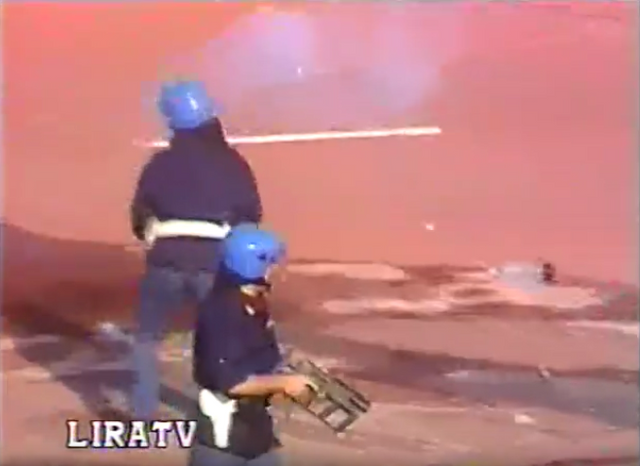 But in a matter of moments, the Salerno May-daydream turns into a daymare, as Federico Giampalo shockingly equalises for Pescara only one minute after the Verona news. 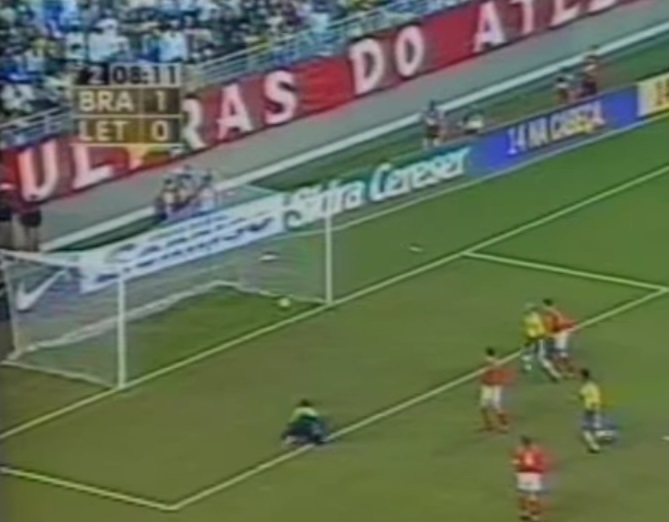 This is shortly followed by Marco Negri scoring the goal that will send Perugia up in the other match, making the whole thing academical. 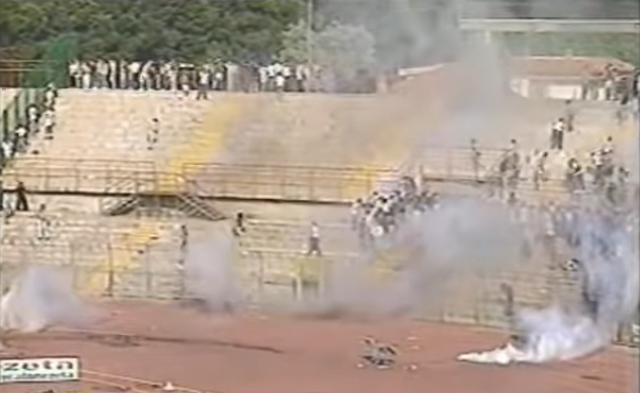 No amount of sticks, smoke or rage were going to change the fact that Salernitana wern’t going up. But for certain individuals, the ritual conflict that transpired may well have been just as exhilarating as watching a group of strangers winning a sports game. 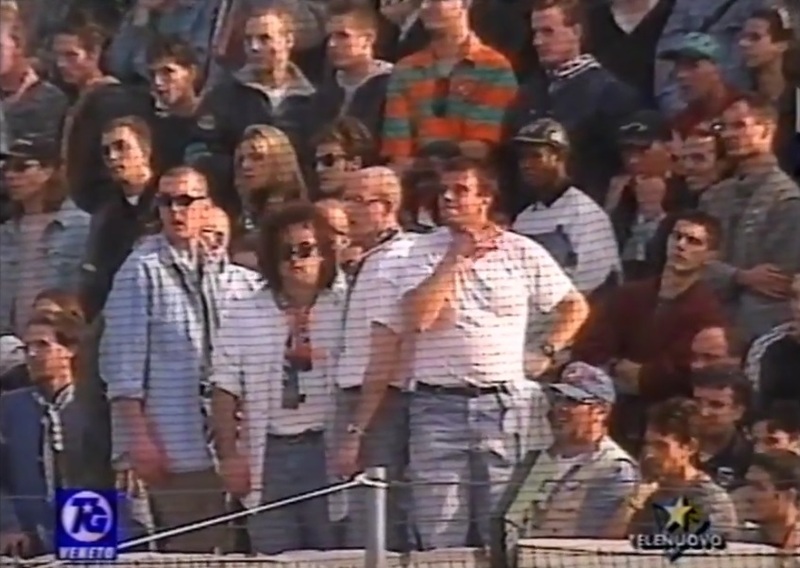 Within a couple of years, the long wait to get back to the big time would in fact end as promotion was achieved at the end of 97/98 (going straight back down the following season, never to be seen in Serie A again).